The advancements in the field of science in the past fifty years have highlighted the need to integrate all fields of human endeavours and have emphasised interdependency of various disciplines. The separation of humanities, therefore, from neurosciences is a preposterous practical joke on all thinking men. With the human genome project on the anvil, biotechnology is making significant headway holding out promise for organ regeneration. Macro evolution is over, but micro-evolution continues in the brain. Neural Darwinism thus, continues to evolve as long as individual remains conscious and has memory. In the milieu of widely varying internal physiological mechanisms and external stimuli, an alternative theory to preprogrammed directionalism is proposed by three mechanisms namely developmental variation and selection, experiential selections and reentrant signalling. Reentrant signalling reorients and correlates the external inputs leading to psychic development preceding the development of consciousness. The cholinergic and aminergic neuro-modelling systems are well suited to serve as value systems. The main achievement of consciousness is to bring together the many categorizations involved in perceptions into a SCENE. Another part of evolution involved capacity of reentrant signalling to be guided by a value system where it is provided with a lot of choices. With 10(13) neurons and 10(16) connections, freedom of choice may manifest into a 'Buddha' or a 'Hitler'. As part of the evolutionary process, it was interesting how capacity to categorize the need to worship by referring to environment outside evolved into a search within our minds. As the next stage of evolution, neuroscience may, thus, serve as the next gateway to understanding the mind and soul. 31 patients of multiple sclerosis (MS) diagnosed in the last six years in a large teaching hospital were reviewed. 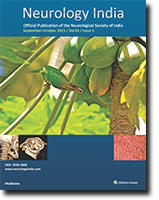 The hospital incidence of 0.85% of total admissions in neurology unit in western India is comparable to the series from other parts of India. The mean age at onset was slightly lower compared to other series. The female preponderence was noted in addition to higher incidence of Devic's syndrome. Visual loss (47%) and motor weakness (27%) were the commonest presenting symptoms. The clinical pattern was more similar to Asian series of MS than the western series. All patients underwent magnetic resonance imaging (MRI) scan. 24 out of 25 MRI of Brain and 15 out of 16 MRI of spine were abnormal. CSF immuno-globulins were raised in 80% of patients who underwent CSF study. The data has been compared with other Indian, Asian and Western series. A total of 100 patients were enrolled in this study with the clinical diagnosis of multiple sclerosis (MS). This included prospective analysis of 35 patients and retrospective analysis of 65 patients from their medical records spanning a period from January 1986 to March 1998. They were divided into 3 groups (i) overall group (ii) MRI group (where MRI was available) (iii) No MRI group (where MRI was not available). Data in terms of clinical features and laboratory investigations were compared in the three groups. MS was found to constitute 2.54% of neurology admission between January 1993 to December 1997. It was higher as compared to previous data from our institute (1.58%). Cerebellar symptoms were higher in the MRI group as compared to the non MRI group. The clinical spectrum of MS in the MRI group was comparable to that in the west. Obviously the MRI helps in early diagnosis of milder and atypical cases. Oligoclonal bands were found in 30.5% of cases only. Forty five patients of multiple sclerosis diagnosed on the basis of Poser's criteria from West Bengal were studied. The male-female ratio was 1:1.5, mean age of onset 31.83 years in male and 29.11 years in females. The maximum cases were between the 3rd and 4th decade.Definite MS comprised of 60%, while remaining 40% were probable.Visual impairment (53.33%), weakness of limbs (31.11%) and sensory paraesthesia (20%) were the common presenting symptoms whereas pyramidal tract involvement (93.33%) with absent abdominal reflexes (90%) and optic pallor (64.44%) were common signs. Posterior column and spinothalamic sensations were involved in 55% and 51% of cases respectively. Inter-nuclear ophthalmoplegia was present in 6.66% of cases. Pattern of involvement commonly showed three or more sites of lesion. Optico-spinal affection was present in 22.2% of cases. Relapsing and remitting course was found in 48. 91%, relapsing and progressive course in 33.33% and chronic progressive in 17.8%. MRI of brain showed positive results in 16 out of 23 cases. CSF study showed increased positivity in estimation of immunoglobulin level than oligoclonal band. Findings revalidate the disease pattern as being similar to that in other parts of India as well as Asia. In this study, the authors present their experience of using extreme later transcondylar approach (ELTC) for treating 7 patients with lesions in the anterolateral foramen magnum, upper cervical spine and cerebellopontine angle reaching upto jugular foramen. The tumours included meningiomas, neurofibromas (2 cases each), chondrosarcoma, epidermoid and aneurysmal bone cyst (one case each). The approach was used alone, in combination with retrolabyrinthine presigmoid approach in a patient with lower cranial nerve neurofibroma extending extracranially through the jugular foramen, or in combination with partial C1-C3 laminectomy in two patients with meningiomas situated anterolateral to the cord from the foramen magnum to C3. In two patients with extradural vertebral artery (VA) entrapment by a chondrosarcoma and aneurysmal bone cyst respectively, the vertebral artery was ligated distal to the tumour. The tumours were totally excised in five cases and partially in two. There was no preoperative mortality. The major complications included cerebrospinal fluid leak from the wound (3 cases) and increase in lower cranial nerve paresis (2 cases). At follow up, ranging from 6 months to 2 years, 5 patients showed no tumour recurrence. There was improvement in neurological status. One patient, with a partially excised aneurysmal bone cyst, showed no added deficits or increase in the tumour size. However, there was a massive regrowth in the patient with chondrosarcoma after 6 months. This technique provided a wide surgical exposure with direct visualization of the tumour-anterior cord interface, early proximal control of the VA and preservation of lower cranial nerves. Head injury is associated with psychological sequelae which impair the patient's psychosocial functioning. Information processing, attention and memory deficits are seen in head injuries of all severity. We attempted to improve deficits of focused, sustained and divided attention. The principle of overlapping sources of attention resource pools was utilised in devising the remediation programme. Tasks used simple inexpensive materials. Four head injured young adult males with post concussion syndrome underwent the retraining program for one month. The patients had deficits of focused, sustained and divided attention parallel processing, serial processing, visual scanning, verbal learning and memory and working memory. After the retraining programme the deficits of attention improved in the four patients. Serial processing improved in two patients. Parallel processing and neuropsychological deficits did not improve in any patient. The symptom intensity reduced markedly and behavioural functioning improved in three of the four patients. The results supported an association between improving attention and reduction of symptom intensity. Attention remediation shows promise as a cost effective, time efficient and simple technique to improve the psychological and psychosocial functioning of the head injured patient. Movement disorders are uncommon presenting features of brain tumours. Early recognition of such lesions is important to arrest further deficit. We treated seven patients with movement disorders secondary to brain tumours over a period of seven years. Only two of these were intrinsic thalamic tumours (astrocytomas) while the rest were extrinsic tumours. The intrinsic tumours were accompanied by hemichorea. Among the extrinsic tumours, there was one pituitary macroadenoma with hemiballismus and four meningiomas with parkinsonism. Symptoms were unilateral in all patients except one with anterior third falcine meningioma who had bilateral rest tremors. There was relief in movement disorders observed after surgery. Imaging by computed tomography or magnetic resonance imaging is mandatory in the evaluation of movement disorders, especially if the presentation is atypical, unilateral and/or accompanied by long tract signs. Advances in imageology have improved the diagnostic yield of cerebral venous/sinus thrombosis (CVT). However, its management remains a challenge. The present study was carried out to study the role of heparin in CVT. Therapeutic outcome of 150 patients of puerperal CVT manifesting within one month of delivery or abortion, was analyzed. The diagnosis was supported by cranial computed tomography and/or angiography whenever required. Seventy three patients, 46 with non-haemorrhagic infarction and 27 with haemorrhagic infarction, received 2500 units of subcutaneous heparin, three times a day within 24 hours of hospitalization till 30th post partum day or symptomatic relief. Seventy seven patients during the same period, 50 with non-haemorrhagic infarction and 27 with haemorrhagic infarction, who did not receive heparin formed the control group. Repeat CT scans were done when indicated. Among the heparin group, 34 patients made full recovery. There were eight deaths, all among the patients with haemorrhagic lesion. In control group, only 14 patients recovered completely (P=<0.001) and 18 died (P=<0.001). There were no adverse effects of heparin. Low dose heparin is safe and efficacious in puerperal CVT, even in patients with haemorrhagic infarction. An overwhelming majority of disappearing CT lesions in India have been aetiologically linked to cysticercosis. We report 4 patients with disappearing CT lesions in whom the lesion later reappeared at the same (3 patients) or different site (1 patient). One patient was a Taenia carrier. Serial MRI evaluation in one patient revealed a persisting lesion in the interval period. The contribution of these observations towards the understanding of the aetiology of disappearing CT lesions is discussed. A boy developed sudden severe generalized muscle stiffness, bulbar weakness and passed dark coloured urine. Laboratory tests revealed marked elevation of creatinine kinase(CK) levels and myoglobinuria. Histopathology of quadriceps muscle showed features of acute rhabdomyolysis. Patient made complete clinical recovery over a period of three weeks and CK returned to normal level. The possible aetiologies of non-traumatic rhabdomyolysis are discussed and the relevant literature reviewed. Medullomyoblastoma is a rare tumour seen in childhood. We report a medullomyoblastoma occurring in the cerebellar vermis of a 4 year old boy. The light microscopic features, immunohistochemistry and histogenesis are described. A young adult presenting with 11 months history of fever, headache, vomiting was found to have CSF lymphocytic pleocytosis with increased protein. His serum tested strongly positive for Brucella (standard tube agglutination titre 1: 320) whereas CSF was weakly positive. He became asymptomatic on treatment with tetracycline, rifampicin and streptomycin with significant CSF response. This case is reported because of its rarity. A seventy eight year old man sustained penetrating injury to right orbit about 15 years ago. Later he developed right orbital infection leading to phthisis bulbi. Two months before admission he developed CSF leak from the right orbit, tension pneumocephalous and meningitis. A rare case of CSF orbitorrhoea is reported here along with the discussion on mechanisms and management. The dopamine, glutamate and GABA systems are known to mediate the effects of alcohol on the movement disorders, though their exact roles are not clear. Thus, use of alcohol has implications for pathogenesis as well as management of the movement disorders. These implications are discussed citing a patient who had a strong family history of Huntington's disease and in whom movement disorder and behavioral problems were manifest under alcohol use and withdrawal, but not while being abstinent. A case of choroid plexus papilloma resembling meningioma of cerebellopontine (CP) angle with its extension to foramen magnum is presented. Occurrence of this tumour in CP angle is very rare. Its extension towards foramen magnum is further rare. It was a real diagnostic enigma preoperatively as the tumour was resembling meningioma upto some extent on radiological study. Retromastoid craniectomy with microsurgical excision of tumour and its extension was achieved in toto. Tumour was attached to few rootlets of lower cranial nerves which were preserved. Attachment of the tumour with lower cranial nerves again caused diagnostic confusion with neurofibroma intraoperatively.